This Week's TV: Guess which show features a Wolverine cameo! Plus Shannen Doherty is a witch again! 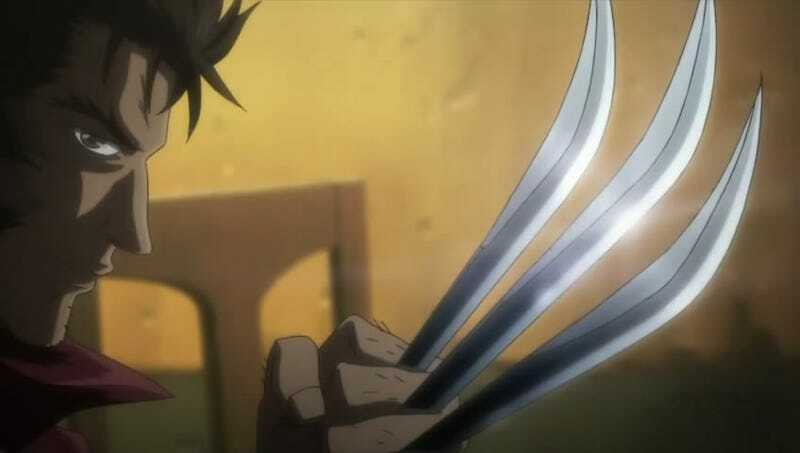 On this week's TV, Wolverine shows up to deal with some flying shrimp. Also, The Walking Dead features some sage relationship advice. But more importantly, the British Being Human returns to American TV — and it's twice as crazy as ever! Also, Shannen Doherty is playing a witch once again, and chewing enough scenery for four Halliwell sisters! And this week's Fringe episode will be full of huge, universe-shattering answers — see for yourself! Plus check out tons of sneak peeks from this week's episodes. Television — it'll make your cranium burst. In a good way. By the way, we're trying a slightly different format this time around — let me know in comments how you like it. We're covering fewer shows, and giving a proper listing to every show on the list. Which hopefully means an easier read, and less detritus to wade through. Special night and time, after the Hall of Game Awards. A video game troll escapes into the real world, and meanwhile Lyle's practical joker friend comes to town and causes trouble. And there's a second episode of Level Up Tuesday at 8 PM. Fox is promising this week's episode will include more revelations about Rebecca's grandfather and why the heck he's so important in the past as well as the present. Meanwhile, our gang hunt down a vicious killer who has a background in chemistry, and uses it to go around poisoning people. And yes, it's mighty obliging of the inmates to return one at a time. Here's a sneak peek. In "Mama Said There'd Be Decades Like This," Josh finds out Sally's mom is dying, and Sally longs to be reunited with her. Meanwhile, Aidan — surprise! — gets haunted by his past. And judging from this sneak peek, Josh gets into a spot of bother with the cops. It's a Lauren-centric episode, in which the hot human doctor, Lauren, decides to take Bo out for a night on the town for a "Succubus test" to see if she's learned control around humans yet. And then they go off to visit the "foot soup" lady, a fae who ate a human who disagreed with her. Meanwhile, Kenzi accidentally eats the "foot soup" herself, and it's a race against time to save her life. This "found footage" horror series is getting some pretty horrifying ratings so far, so I wouldn't get too attached to it. In any case, this time around, the crew finds one of Emmet's crewmembers who went missing at the same time as Emmet. The missing crewmember is cursed and diseased, and everybody except for Lincoln wants to leave him to die. Here's a sneak peek. PBS is running three hours in a row of this series about whales and dolphins and their secret world, featuring Planet Earth's Doug Allen, and Jacques Cousteau's former cameraman, Didier Noirot. The first hour covers the lives of great whales. The second deals with the cognitive and emotional lives of whales and dolphins. And the third is about the weird senses of marine mammals — including echolocation, whistle-and-click communication, and ultrasound. This time, the Ridley Scott-hosted show takes on Jules Verne, the man whose main achievement was giving The Rock a reason to pop his pecs. (Not really.) The show describes Verne as the "ultimate futurist" who put a man on the Moon 100 years early, and criticized the Internet in 1863. He also predicted skywriting, teleconferencing, fuel cell technology and viral marketing. We're probably not going to list Big Bang Theory in What to Watch every week, assuming we stick with this new format — but this week's episode seems particularly appropriate to mention, since it focuses on Wolowitz's astronaut training. Said training is tough enough that it causes Wolowitz to have second thoughts about his desire to go into space. Meanwhile, Sheldon's barber gets sick, hence the episode title, "The Werewolf Transformation." The one-hour debut of a new 52-episode anime series with a totally insane premise. It's about a group of kids who are the only ones with the power to command and defeat creatures called the Monsuno. And according to the press release, Monsuno is a "living DNA" that "hitched a ride to Earth in a concentrated asteroid pocket" millions of years ago — causing the extinction of the dinosaurs in the process. Now the Monsuno DNA has been reactivated, possibly spelling the end of the world, unless those kids can learn to control the Monsuno monsters. This show continues its habit of dealing, at a slight remove, with hot economic and political issues. This time around: the Machine leads Reese and Finch to a trader at a big Wall Street investment bank who's pulling a million-dollar financial scam. Expect lots of scenes of Reese beating up bankers, once again. In this week's episode of the stylized James Bond spoof, Archer helps Gilette save his younger brother from a corrupt backwoods sheriff in West Virginia. And judging from this promo, it looks like all of the redneck stereotypes will be in full effect. We're back to the Count Dooku/Asajj Ventress vendetta, with Dooku determined to get revenge against Ventress and the Nightsisters after their betrayal. Dooku launches an all-out droid attack against the witches, who — not surprisingly — use dark magic to protect themselves. Here's a preview. According to this extended promo, "Answers are Coming" in this Friday's episode. Looks like Peter's actually going to be venturing inside the mind of an Observer, and meanwhile David Robert Jones will be doing some unpleasant stuff to Nina (and probably Olivia, too.) Friday can't come soon enough. Sadly, this is the last new episode for a whole month. It's a supernatural love triangle! Michael's high school sweetheart turns up, with an irreversible condition, and Michael will stop at nothing to save his ex-girlfriend's life. Except that Michael's dead wife, Anna, disapproves. Meanwhile, Zeke's best friend's cancer has returned. I bet you were wondering when this show was going to do its own "supernatural cage-fighting" episode — every monster-hunting show needs one, right? Well, wait no longer. Nick and Hank investigate a weird double homicide that leads them to a boxing gym that turns out to be a front for — wait for it — a monster fight club. Monroe goes in and gets in over his head, so Nick has to summon his inner Grimm to save Pilates Wolf. Good times! Merlin gets drawn to a far-off village where a mysterious illness has struck. Soon enough, the young wizard finds himself stuck in a deadly cat-and-mouse game, where he's not sure who's the cat and who's the mouse. This time around, we're finally getting into the anatomy of the Greys! Find out just where those weird blobby-headed, pip-eyed monsters come from, and why they're so awesome. Wolverine guest stars! (Hence the "claws" in the episode title, "Blades and Claws.") Blade goes to Madripoor, and meets Wolverine and an angry street gang. And Wolverine macks on Blade's girlfriend, and says the immortal line about mangy dogs and flying shrimp, at left (via). Check out this totally insane sneak peek, complete with screamy faces way too close to each other. Syfy is having a "double feature" of fairy-tale movies, with this film repeated at 11 PM in case you come in late. In Black Forest, a group of unfortunate tourists gets lost in some chocolate cakea magical forest. Evil fairy-tale creatures are plotting to kill all the tourists and steal one of their babies. Yes, Syfy is full-on trying to copy the success of Once Upon a Time and assorted movies. Here's a promo. It's the second part of "Orion Pax," in which Megatron tries to control an amnesiac Optimus Prime. It's sort of Desperately Seeking Susan, with transforming robots. And here's the other half of Syfy's fairy-tale double feature. Starring Shannen Doherty! Who says, "Did you think you could run from me, warlock? As long as I breathe, you belong to me," in this awesome sneak peek. It's twenty years after the "Hansel and Gretl" story, and a grown-up Hansel (Stargate Atlantis' Paul McGillion) goes into the forest seeking revenge on the witch — only to find out his sister Gretl (Doherty) isn't dead as he thought. Instead, she's the witch's protégée. Ooh. The original British version of this supernatural-housemate saga returns, at last. There are new cast members, new plot twists, unexpected guest appearances, and a new type of supernatural creature. In "Eve of the War," a child born of werewolves is at the center of a huge battle — and it could have massive ramifications for events decades from now. Check out an intense promo, at left. A special movie-length CG-animated installment of the Italian series about a group of kids in fairy school. This movie was actually theatrically released in Italy, and various other countries. Anyway, an evil witch wants to destroy Bloom and the other girl heroes, but they manage to save the day, setting up a whole new series of plotlines. Yay, an alternative to the Oscars! In this episode, an outsider shows up and puts Rick and Shane at odds. Meanwhile, Herschel's youngest daughter faces a momentous decision. And Andrea steps in to offer some help. And in this sneak peek, Lori offers some relationship advice to Maggie. After an all-new China, IL at midnight, there's another new Frankenhole, in which we discover "Victor Hugo's Identity!" At left is a sample of what you've been missing on this show.